JANCKER wrote: I will mention the WC even if it's not Bayern cause that was an important win for our boys also. What are you talking about? That WC was pretty much Bayern's Germany my arse. 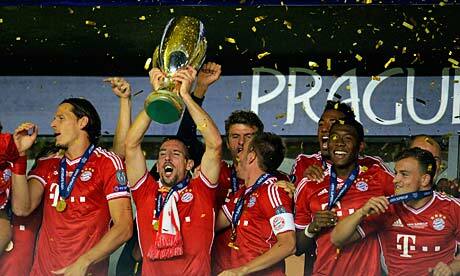 And the European Super Cup was an amazing achievement and moment too. The last throphy left in our history was finally obtain and how it was by beating Chelsea with the same medicine. MUTU wrote: I don't want to put my top moments, because that must include Mueller's goal against Chelsea. A very short-lived moment, but it was one of the happiest footballing moments for me in any case. So I imagine how much was your frustation after that game. This lost affect me too much, that despite the victory a year later, is very sad to remember this. Hurt. About specific moment, the goal of Roy Makaay in the round of 16 of the 2003/2004 season against Madrid, I scream this goal much than any other goal, I dont know why but this goal define my love to Bayern, despite I was watching them before. I thought Bayern still dominated the extra time. Drogba fouled Ribéry in the box. In hindsight he was super lucky not to see red. I was very lucky..I didn't stay up late at night in 11/12 season to see ucl..I read in newspapers the next day..so we won against basel i was happy..against madrid super happy..then we met chelsea in the final i read up the next day that we lost on penalties but in india chelsea fans outnumber bayern by 1 to 100000000000000000000 literally..so they told me chelsea deserved to win so i thought maybe chelsea are a better team than bayern and i didn't feel very sad..now i realise what really happened..and I seriously wouldn't have been able to bear that loss....I would have cursed robben for rest of my life..luckily I started religiously following them by staying up late in 12/13 and we know how that ended..
prasun77 wrote: I was very lucky..I didn't stay up late at night in 11/12 season to see ucl..I read in newspapers the next day..so we won against basel i was happy..against madrid super happy..then we met chelsea in the final i read up the next day that we lost on penalties but in india chelsea fans outnumber bayern by 1 to 100000000000000000000 literally..so they told me chelsea deserved to win so i thought maybe chelsea are a better team than bayern and i didn't feel very sad..now i realise what really happened..and I seriously wouldn't have been able to bear that loss....I would have cursed robben for rest of my life..luckily I started religiously following them by staying up late in 12/13 and we know how that ended.. There were plenty of special moments but this was a very special one because I was watching it outside with a friend who isn't a Bayern fan(can't find any around here) but we celebrated it together in front of a RM crowd... I wouldn't call that just celebration but some kind of insane sick otherworldly ill celebration... I bet that they wanted us dead. We were seated in front of the screen. Besides the CL, I always say it is this. Equalize at the 89min, score a Wiese goal at the 115min and then equalize at the 120min. And Kahn punching Van Bommel's face. Can't beat that. That was a game of the highest proportions of joy and sorrow. I can't remember a single game where the highs and lows were so brutal. Maybe the Man. Utd loss, but that was a surreal loss, happened so quickly. The Chelsea game was the ultimate painful, torturing game for a fan to see. Since that game, my sorrow threshold when watching Bayern are losing/playing bad/have no luck has became pretty high. And I've seen quite a plenty Bayern games, been following them since 1995/6. edit - Wow, just typing the year reminded me, 20 years as a fan. And i'm 28. Yes. But because of what happened the previous season, my celebrations of Robben's goal were somehow subdued, so the actual moment of Mueller's vastly-deserved opener was much greater for me.